The book I wanted to share with you today is by one of my favorite authors. I first learned about Maria from her first cookbook. My mom had picked it up and sometimes when I’m at her house, I raid her cookbook collection (and by raid, I mean borrow for an extended period of time). I had just started my path down whole grains when I picked up Ancient Grains for Modern Meals. I fell in love with Maria’s creative use of grains and she is one of the biggest proponents of ancient grains. 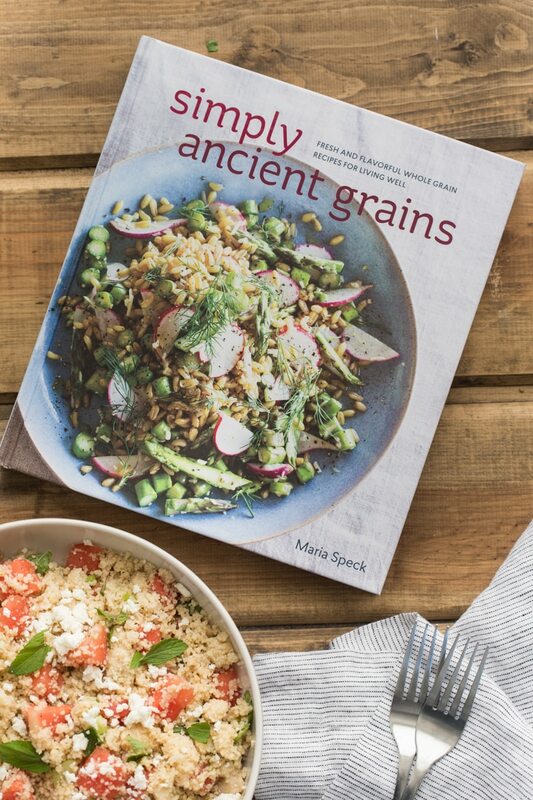 Her newest book, Simply Ancient Grains, is a wonderful follow-up to her first book. The cookbook spans breakfast through mains and to desserts. It’s a good sign when I flip through a cookbook and want to make nearly every recipe. I started with the giant spelt pancake with squash blossoms (not only creative but beautiful too) and followed it up with this summer couscous. Fruit and grains has been a theme for me this summer (starting with this cherry and quinoa salad). The salad is light, refreshing, and perfect for any picnic or cookout. If you’re a grain lover like myself, I highly recommend checking out both Maria’s books. They are both a wonderful inspiration to really dive into the world of Ancient grains! Bring the water to a boil in a small saucepan. Remove from heat and add the couscous, salt, and saffron (if using). Cover, set aside, and let sit until the water has absorbed, about 10 minutes. Fluff the couscous with a fork and transfer to a serving dish, spreading and fluffing again. Let cool. Combine the lime zest, juice, olive oil, honey, the remaining 1/4 teaspoon salt, and pepper in a jar with a tight lid. Shake until the dressing has combined. 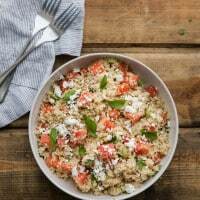 Once the couscous has combined, add the watermelon, celery, and mint. Drizzle the mixture with the dressing and gently toss. Let sit for 30 minutes (if you have time) then top with extra mint, feta and an extra drizzle of olive oil. Taste and add salt and pepper to your liking and serve. Recipe from the cookbook Simply Ancient Grains by Maria Speck. What exactly is pearled couscous? I accidentally tacked on an ‘ed’ but it should have been pearl. Typically pearled refers to what Maria mentions in her comments below but in this case, Pearl Couscous (also referred to as Israeli Couscous) is a toasted pasta that is in the shape of small balls. I absolutely love watermelon. I could eat it every day. I can’t wait to try this! I adore watermelon, feta and mint in a salad. I love that this one is beefed up with a little wholegrain action. Can’t wait to try this! This sounds like a light and delicious summer salad. Thanks for introducing Maria’s new book. I’m with you on physical copies of books — especially when it comes to cookbooks! The book sounds really interesting, I will definitely check it out. 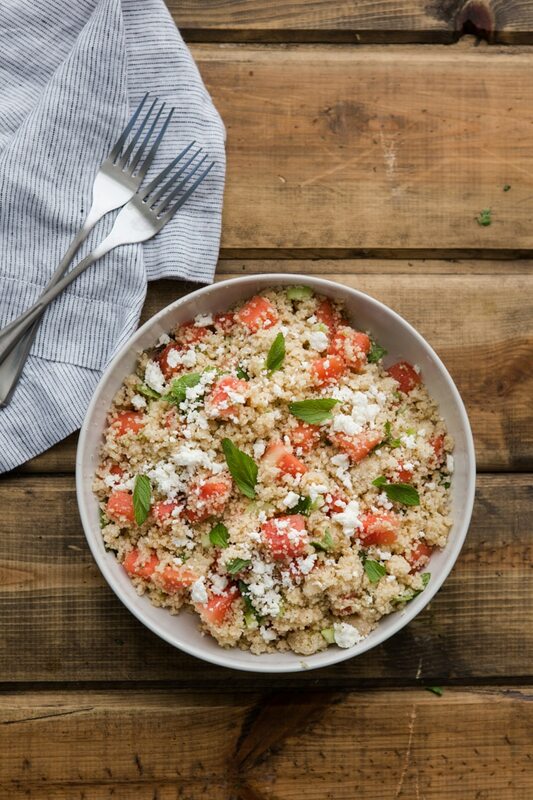 It looks like the couscous-watermelon-feta combo worked perfectly. I can’t wait to find out what more is in store in Simply Ancient Grains. So fabulous to see this, Erin and thank you, for sharing one of my favorite lazy summer salads. And I’m beyond thrilled that you enjoy my new cookbook. In response to Cassie: pearled in connection with grains typically means that the outer bran layer and the germ have been completely or largely removed. Most often the term pearl (or pearled) is used in connection with barley. Removing the bran and the germ also removes most of the nutrients in grains, such as fiber, vitamins and minerals. Hope you enjoy the salad some day!